Every year I say I'm going to volunteer at a race and it never seems to fit in my training schedule (world's worst excuse). At least last year we did our "High 5 Station" at the Garmin Marathon and had a complete blast. This year, I'm going one step forward and volunteered to be the Kansas City Corporate Challenge Triathlon/Duathlon coordinator for my company. This means begging and pleading people to participate in probably one of the more challenging events. I've participated in this triathlon in 2011, 2012 (the only triathlon I did that year), and 2013. I've mentioned in the past problems with my left foot, but never elaborated. Back in June I noticed during bike rides more than 20 miles I had a "hot spot" on the ball of my left foot between my big toe and the next toe (pointy toe?). It never hurt but was definitely annoying. I actually did mention it back in August in this post. 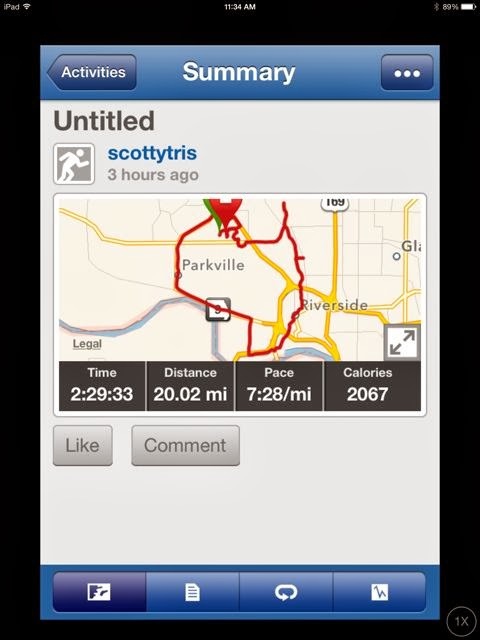 During a 20 mile run back in November, I ended up calling TKB after 15 miles because it hurt like crazy. Normally I can rub on it for a bit and it is fine. Not this time. I talked to the doctor in my annual "well man's exam" in December. He suggested some metatarsal pads to provide more cushion. I went to a local running store and they installed them. I later adjusted them because I was stupid. If they are there to provide more cushion, shouldn't they be under the ball of my foot (no, they aren't.. that's one of the worst things to do)? Not stupid enough? I then went for a 10 mile run on them and then a 5 mile treadmill run the next day. Two days later, that spot hurt like crazy. The next week I got a referral to meet a podiatrist who is also a local triathlete. When I finally met him on December 26, he did an x-ray and ultrasound of my foot and diagnosed it as a neuroma. We talked about what caused it and we quickly pinpointed my cycling shoes. When I bought my triathlon bike in February, I went from SPD cleats to SpeedPlays. The Doc suggested I look at the cleat placement and move them away from the balls of my feet. Oh... and he gave me a cortisone shot to help loosen up the neuroma. The Doc explained that I may have a painful reaction from the shot but it only impacts 1 of 50 people. Well, my friend Jill got a cortisone shot recently and feel free to read her experience about it in this post (seriously, go read it and read the entire post. It includes her report of spectating my ironman!). She was amazed that it took her 7 months to get her cortisone shot when it took me about 5 minutes of saying "wah" and some ultrasound goo on my foot. For the record, I never experience that pain. I finally got around to adjusting my cycling cleat. Sure enough... my left foot's cycling cleat was adjusted as far under the ball of my foot as possible while my right cleat was adjusted in the middle. I moved them all away from the ball of my foot. Unfortunately I won't be doing another long run for a few weeks, so I won't know for a while. I can't say it's feeling any better yet but it doesn't usually flare up lately until I do a long run. I've been fighting off a sinus cold lately. It's been pretty annoying. It first hit me before Christmas and then again a few days later (had to take Friday off from work) and again on New Year's Eve. Basically, any day I had off the last two weeks I've been laid up with this stupid cold. Before it really hit me on New Year's Eve, I did manage a 5 mile run outside in the 50 degree temperature. I averaged 7:48 pace in my aerobic zone so I'm feeling pretty good that the reduced training since October is still keeping me with a good base for the upcoming season. My average heart rate was at the top of my aerobic range, if not pushing my anaerobic threshold. That's not quite BQ (it's a 3:15 marathon and I need 3:08-ish) but I felt that had I been in a race with a pace group, it would have happened. (Note: that was also my coldest run ever at 12 degrees). I'm targeting Garmin Marathon in April (the site of last year's "High 5 Station"). For the record, I loathe training for endurance events during the winter. I'm not a New Year's Resolution type of person but I do have a goal to improve my swimming. So I'm finally taking the plunge and joining a Master's Swimming class. Assuming this cold doesn't hit me again, I'm going on Saturday. I talked with the coach over the past weekend, suckered another coworker to join me, and mentioned it to a few other people (to make me accountable) and now I'm telling my three blog readers to make me even more accountable! I'll report back on Monday! Enough musing for now. Thanks for reading!! I think you should sign up for another IM this summer to see if your Masters swim class really improves your time. Kentucky??? You know I'd love to! Return to ironman distance racing in 2015!